The United States Mint today, August 16, 2012, released the circulation quality Benjamin Harrison Presidential $1 Coin in rolls, bags and boxes. The new US Mint products relating to the 23rd US President were made available beginning at Noon (Eastern). 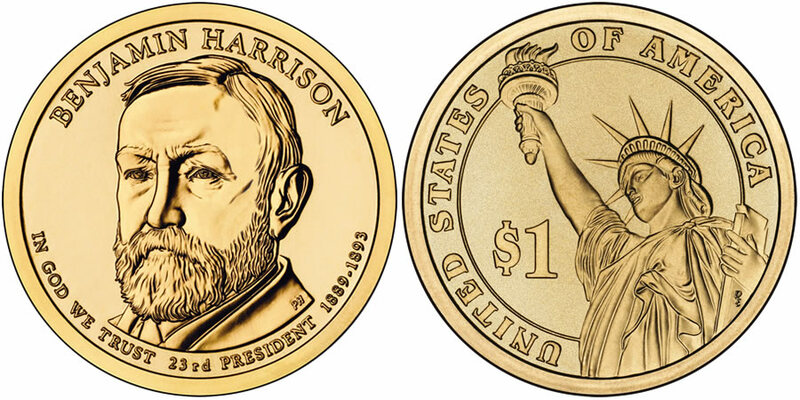 Each Benjamin Harrison Presidential $1 Coin depicts a portrait of Harrison on the obverse. The reverse of all of the coins in the series showcases an image of the Statue of Liberty. Presidential $1 Coins made their debut in 2007. New strikes of the series are issued at a rate of four per year honoring the former Presidents of the United States in the order in which they served. This series is expected to continue at that release rate until all eligible individuals have been honored. Coins of the series were originally also issued into circulation. That procedure changed late last year when U.S. Treasury Secretary Timothy Geithner ordered a halt to the practice as stockpiles of $1 coins were believed to have been sufficient to serve the needs of commerce for years. Consequently, new releases of the program are only struck for numismatic purposes. This includes these bags, rolls and boxes of Harrison coins. Despite having a circulation quality finish, the coins are only initially available directly from the US Mint. The 25-coin rolls are offered for $32.95 per roll. Buyer's have the choice of coins struck at the US Mint's facility in Philadelphia or coins struck at the US Mint's facility in Denver. 100-coin bags of Harrison coins are being sold by the US Mint for $111.95. Once again, buyer's have the choice of Philadelphia or Denver struck coins. 250-coin boxes of these Presidential 1 coins are available for $275.95. Like the previously mentioned products, Philadelphia or Denver minted coins are available. Finally, the US Mint also has 500-coin box options in either 'P' or 'D.' These large boxes are being sold for $550.95. In addition to the Mint's standard shipping and handling charge of $4.95 per order, the US Mint has placed a shipping surcharge on each 500-coin box ordered of $7.95 due to their weight. 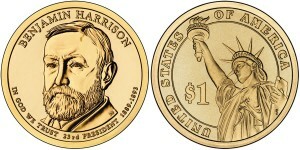 Orders for the new Benjamin Harrison Presidential $1 coin products may be placed directly on the US Mint website of www.usmint.gov or by calling 1-800-USA-MINT (872-6468). Later this year, the US Mint will release the Grover Cleveland (2nd Term) Presidential $1 Coin as the fourth and final strike of the series to appear in 2012.